“There is always something tremendously exciting about beginning a New Year… It is the beginning of a new page; a page of some fascinating, illumined parchment. An ancient page, but to us still unread. What will it hold? 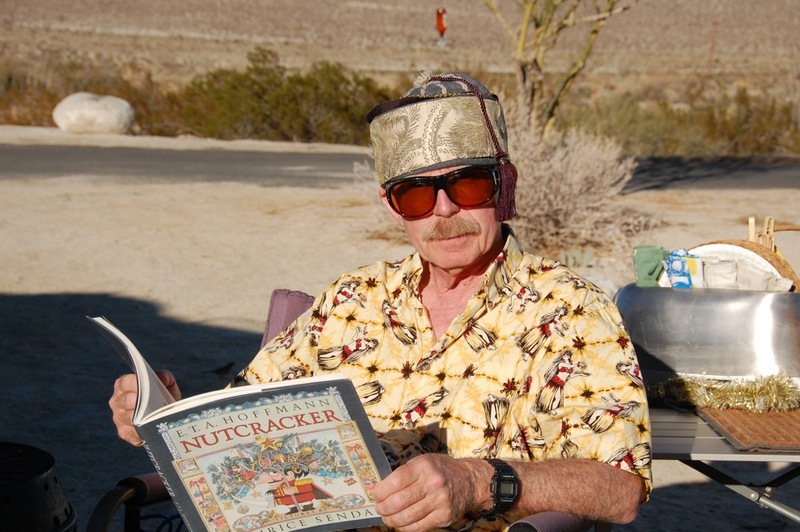 The desert is full of mystery and surprise.”** Thus begins poet, author, and artist Marshal South‘s* account of his family’s 17-year experiment in living a primitive lifestyle at their home, Yaquitepec, on Ghost Mountain in the Anza-Borrego Desert. Some might see this area as desolate, but Marshal saw and wrote about the desert’s cornucopia of animals, plants, weather, stars, and peaceful beauty. Escaping the stress of urban living for 5 days each month through spring and relaxing in the desert helps restore our sanity. Our desert mornings typically begin with a beautiful sunrise that bathes the nearby mountains with an ever-changing array of dusty pastel colors. 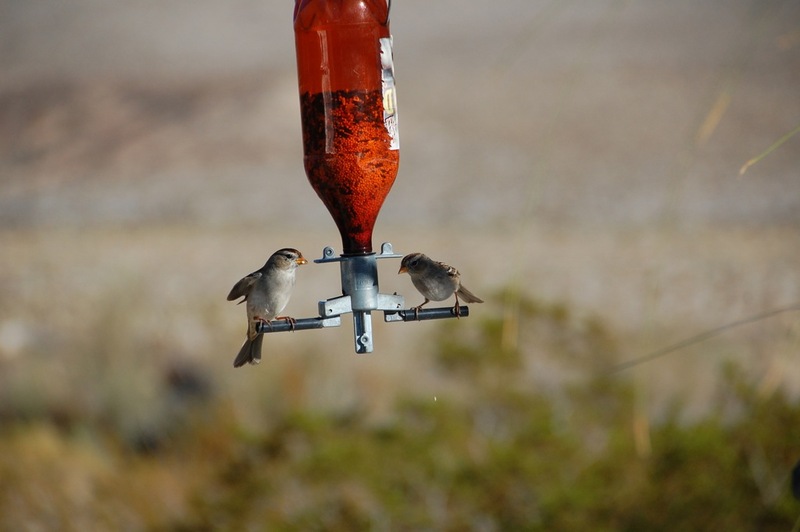 We delight in watching and listening to the birds that emerge and feed on birdseed that Larry placed in the bird feeder or scattered about. 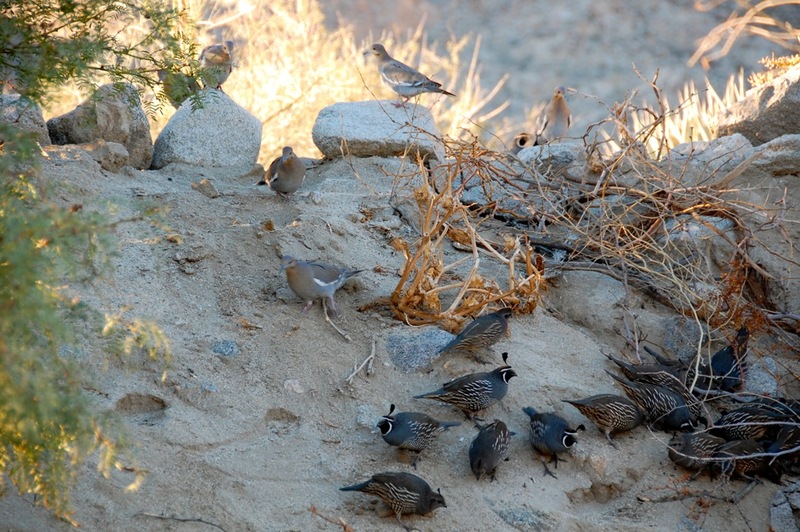 Gambel’s quail and White-winged doves feast on wild birdseed scattered on our nearby embankment, while White-crowned sparrows land and spin around on the hanging bird feeder. After my morning coffee and toast, listening to the news and weather, and watching the sun rise, it was time to send out our Nutcracker to survey the prospects for a good morning hike. He reported that prospects were good for me, but he’d stay behind due to his stiff legs. So with camera in one hand and walking stick in another, water bottle on my waist belt, and Tilley hat* on my head, I ventured forth on the Moonlight Canyon Trail. 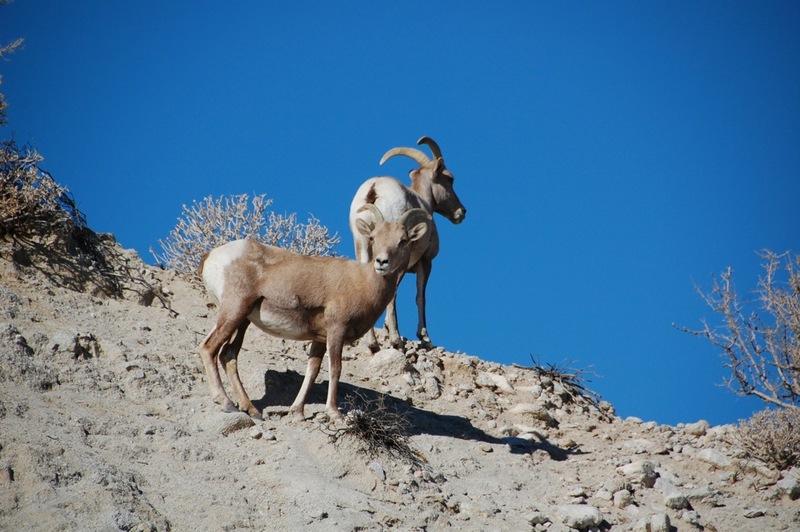 I traveled slowly and quietly in hopes of seeing the bighorn sheep that I first encountered four years ago. 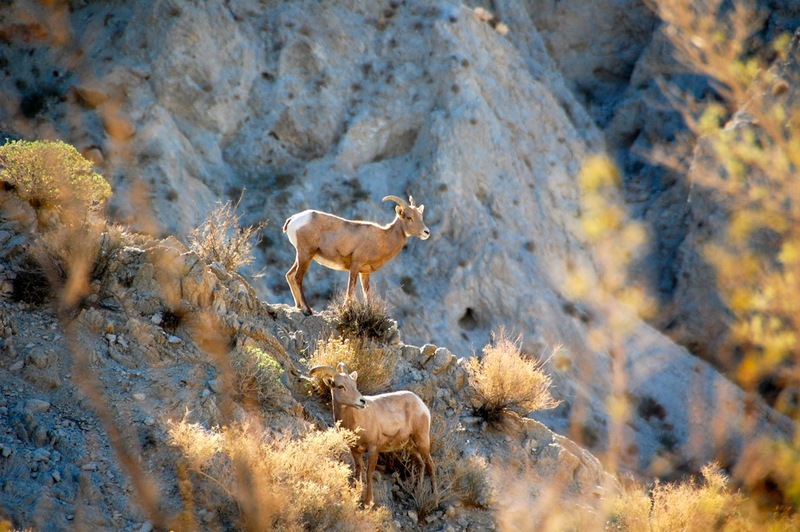 I wasn’t disappointed as I rounded a curve in the trail before entering the canyon and spotted two bighorn sheep grazing on new vegetative growth after recent rains. They seemed to recognize me, and came down off the small ridge, walked across the trail, and scampered up the ridge on the other side. They paused and took another look at me before going over the ridge and galloping across a relatively flat watershed area to the east of the campground. 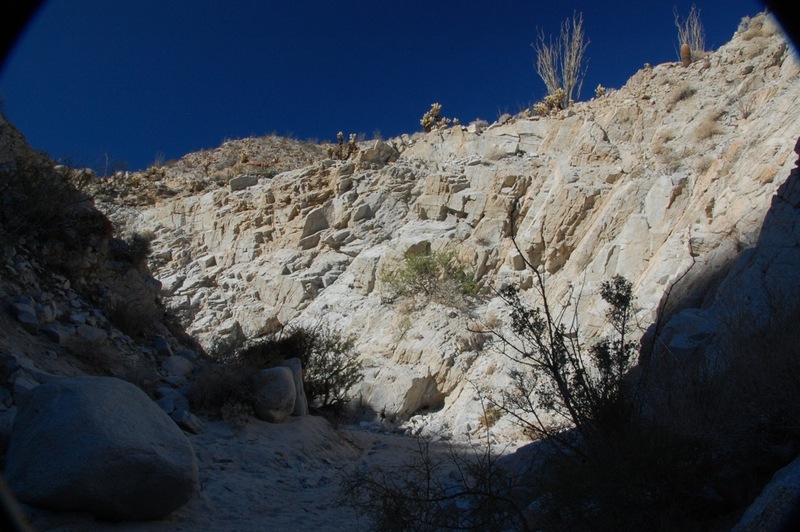 I then entered the shaded portion of Moonlight Canyon with its refreshingly cool air chilled by granite walls that retained the previous night’s cold. 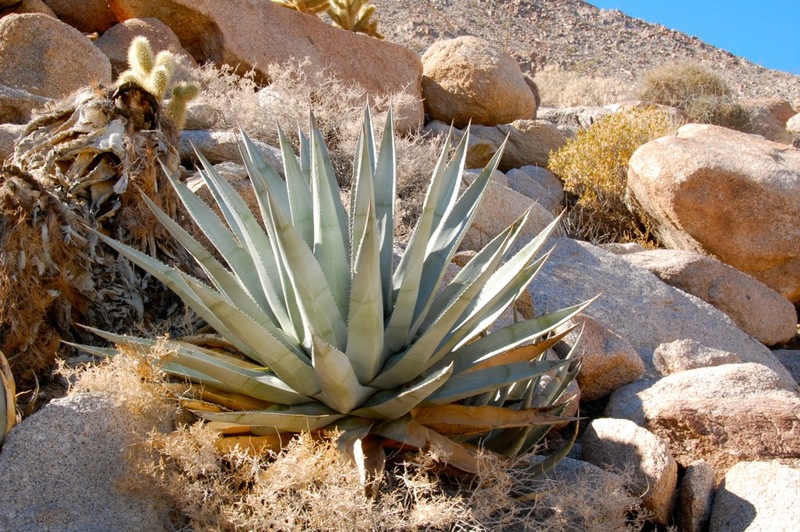 The trail then opened up into warm, full sun with cholla, barrel cacti, and ocotillo piercing a deep blue sky. I always enjoy a shower after a good hike before lunch, so I returned to the trailer, changed and grabbed a towel, and called out to a raven* that recognized me and circled about while calling back* to me as I made my way to the campground’s shower. 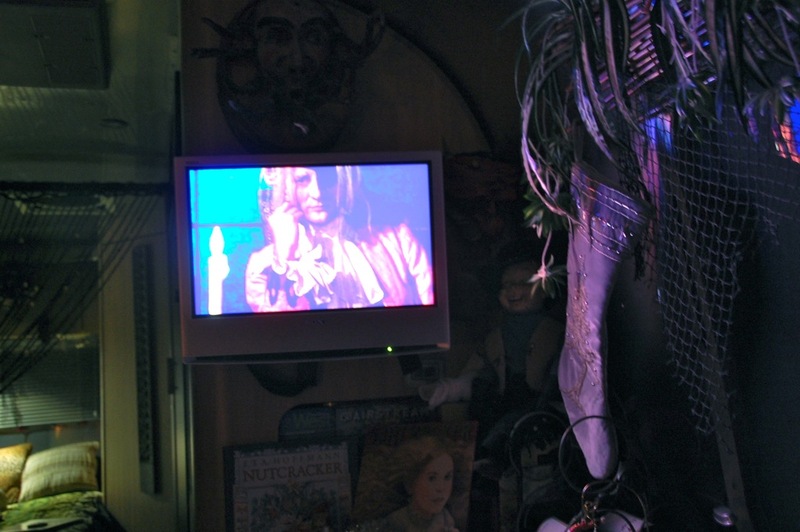 *This is a link to a YouTube video. **Marshal South and the Ghost Mountain Chronicles: An Experiment in Primitive Living, 2005, Edited and with a Foreword by Diana Lindsay and Introduction by Rider and Lucile South, Sunbelt Publications, San Diego, CA. 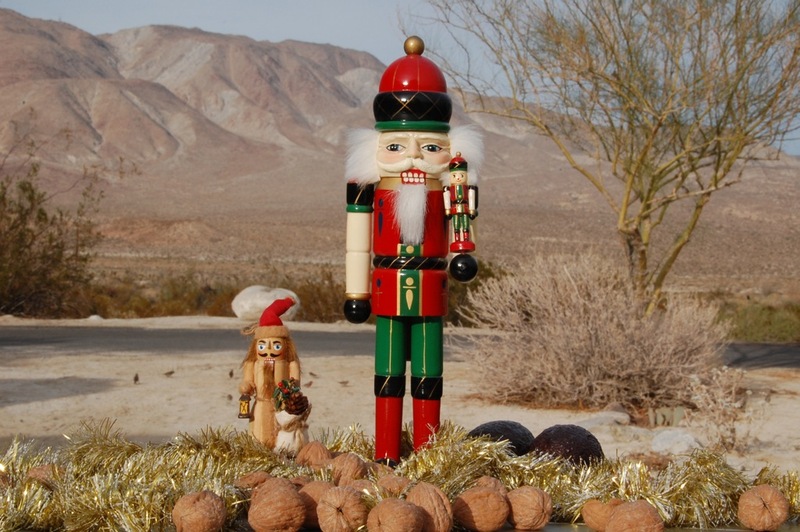 Nutcrackers and nuts returned with us to our latest, favorite site in the desert to bask in the warm sun and cheer us inside the trailer during the cool December evenings by the Vallecito Mountains. We were lucky to enjoy five sunny days before the Pineapple Express delivered wind and rain as we safely crossed over the mountains (due in part to Airstream’s aerodynamics and handling stability*) on our way back to San Diego last Friday. 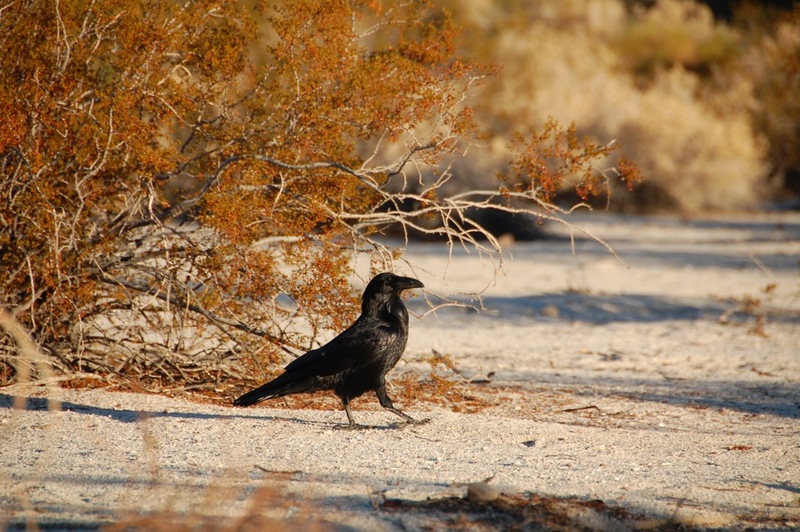 Larry enjoyed getting up before sunrise and taking walks while sipping hot coffee as the sun rose. Meanwhile, on the first morning, I was busy taking advantage of how beautiful the early morning sunlight looks as it streams into the Airstream, making everything look happy and festive. 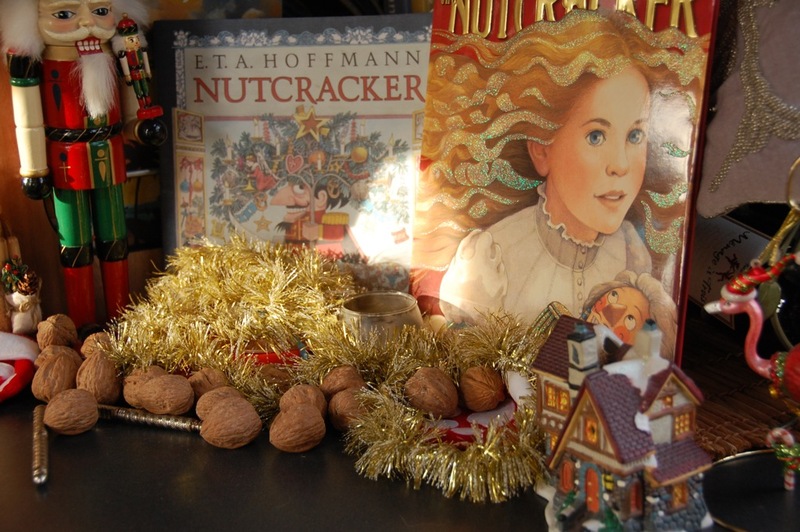 Featured in this display is E.T.A Hoffmann‘s Nutcracker, first written in 1816. 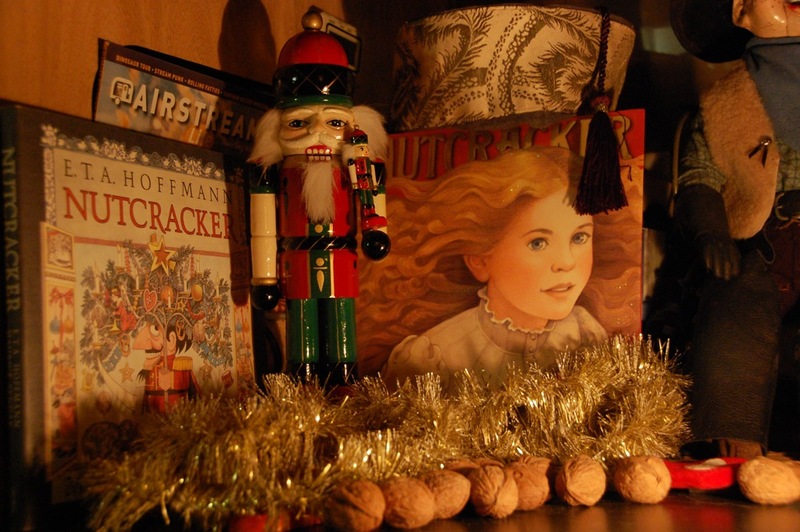 This version was translated by Ralph Manheim and published in 1984 by Crown Publishers, INC., and illustrated by Maurice Sendak,* who did the brilliant set designs and costumes for the Pacific Northwest Ballet’s Christmas production of Nutcracker,* which was made into a movie, Nutcracker: The Motion Picture,* in 1986. This film is my favorite version over the years, but my video wore out, and it wasn’t until 2011 when it became available on DVD. Before viewing my new Nutcracker DVD, I thought it would be good to go back and read the book, a real book that can provide a satisfying sensory experience. For the occasion, I wore a Victorian style smoking cap adapted and embellished by Larry (a work in progress), similar to those worn by Professor Albus Dumbledore,* and a Hawaiian shirt inspired by Dr. C. (insightout). Top 9 tow vehicle (F-250) posts… and much more! Top 11 Airstream care, maintenance and repair posts… and more! Bill D. on Top 9 tow vehicle (F-250) posts… and much more! Bev&Geo on Top 9 tow vehicle (F-250) posts… and much more! 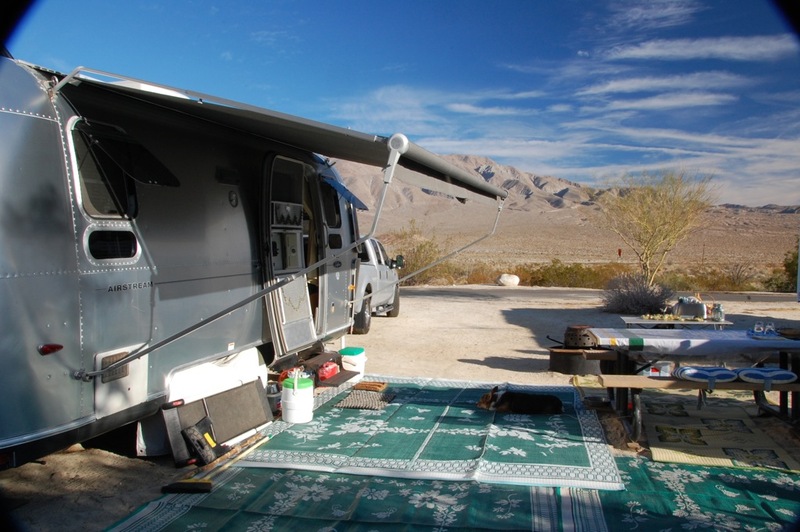 Bill D. on Top 11 Airstream care, maintenance and repair posts… and more!